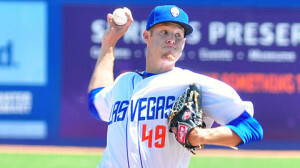 New York Mets prospect Zack Wheeler turned in a strong pitching performance in what should be his last minor-league start before his major-league debut on June 18. Wheeler took a no-hitter into the fifth inning before Carlos Peguero hit a solo home run with one out. Peguero homered twice and drove in three runs while Ben Tenbrink had three RBIs for the Tacoma. Wheeler struck out seven over 5 2/3 innings for Triple-A Las Vegas And faced just two batters over the minimum in a 11-0 loss to the Rainiers. Wheeler is expected to make his MLB debut on June 18 in Atlanta. Wheeler is 4-2 this year in 13 starts with Las Vegas and is pitching to a 3.93 ERA. He has struck out 73 batters over 68 2/3 innings of work allowing 61 hits. Mets ace Matt Harvey made his debut on July 26, 2012 against Arizona. Harvey electrified Mets observers with a power arsenal during his rookie season in 2012 and has established himself as one of the dominant young pitchers in the National League in 2013. The Mets were hopeful Harvey and Wheeler could head the Mets rotation as soon as 2014, but that timetable may be adjusted this summer.